Since Thomas Paine and Benjamin Franklin put type to printing press, Philadelphia has been a haven and an inspiration for writers. Local essayist Agnes Repplier once shared a glass of whiskey with Walt Whitman, who frequently strolled Market Street. Gothic writers like Edgar Allan Poe and George Lippard plumbed the city's dark streets for material. In the twentieth century, Northern Liberties native John McIntyre found a backdrop for his gritty noir in the working-class neighborhoods, while novelist Pearl S. Buck discovered a creative sanctuary in Center City. 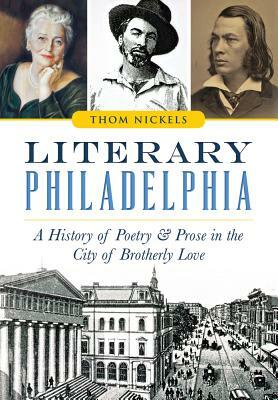 From Quaker novelist Charles Brockden Brown to 1973 U.S. poet laureate Daniel Hoffman, author Thom Nickels explores Philadelphia's literary landscape.